Moving comes with its own stresses, from worrying about whether precious family items are going to be broken, to the emotional stress that comes with leaving a home you’ve lived in for some time. The last thing you need to worry about is whether you’re being scammed by the moving company. 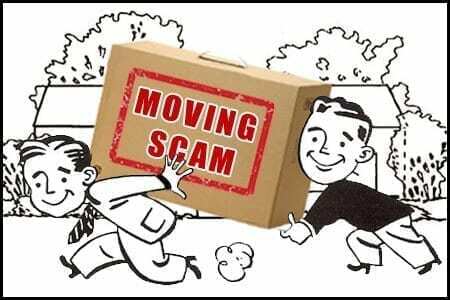 Unfortunately, moving scams happen far too frequently and many smart people get caught up in them. Like any scam, they can be hard to detect until you’re already stuck in the middle of it. By then it may be too late. The bottom line is that you want to avoid moving scams. Here are some common scans, their potential warning signs, and how to avoid them. Shady moving companies can often deliberately lowball the inventory with a bid that’s much lower than other companies you researched, but then pile on extra charges the day you move. For instance, the mover may tell you that the load is much larger than originally estimated and even refuse to deliver your load until he’s received full payment. What to do: Before hiring a company, always check for any complaints that have been made against it. You can check messages boards on a site such as Movingscam.com and ask questions about certain companies. This kind of research can go a long way in helping you to avoid moving scams. A company may honor its lower moving price but tack on additional charges. Your final bill may include hundreds of dollars for moving supplies such as shrink wrap, bubble wrap and packing tape. To avoid this, make sure you get two estimates from a company: one that covers the cost of moving your belongings, the other to cover packaging costs. Be wary of estimates over the phone, particularly when it comes to choosing your mover. A quality company will send an estimator to your house in advance, while an unscrupulous company won’t send anyone until moving day and then charge you far more than their phone estimate. And ultimately, the final price of the move is based on weight. If you want to avoid moving scams like this, obtain at least three in-home estimates before making your final decision. It’s not uncommon for a company to ask for a small deposit up front – say, $50 – to reserve a particular date for your move. That’s not a red flag, but a company that asks for a sizable deposit, like $500, certainly is. Quality companies ask for payment when the job is done. If you’re asked for a large deposit prior to the move, find another company. Quality moving companies not only have a street address and phone number, but an actual office from which they operate. A scam company might not have an actual office or truck. If filling out an online form is the only way to contact them, choose another company. In avoiding moving scams, it’s important to have the estimate done at your house by an actual person, not over the phone. But make sure the estimator takes the time to do his job in detail – a good one will open cabinets and ask questions such as whether you plan on selling or getting rid of any items before the actual move. Likewise, it’s important that you give them as much information as possible.